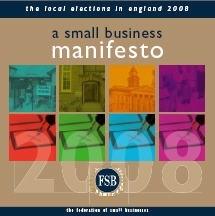 FSB manifesto call on local authorities to take not of small business needs ahead of local elections. With local elections looming on 1 May, the Federation of Small Businesses (FSB) has launched a new manifesto aimed at pressing local authorities to champion the needs of small business. The main thrust of the FSB’s initiative is a campaign to ‘Keep Trade Local’ in the face of what it perceives to be unfair planning laws, draconian parking restrictions in town centres and the breakdown of local economies. We believe local government in England could be doing much more to safeguard the future of small businesses. The local elections on May 1 offer a perfect opportunity for prospective councillors to demonstrate they are serious about the future of their local communities.